"Once I was performing with Walter Davis when he played a pattern behind me that was really wild, really outside harmonically--some Godforsaken interval. I like that kind of spontaneity." Walter Davis, Jr. played with Babs Gonzles's group Three Bips and a Bop while still in his teens, then moved to New York to play with Max Roach and Charlie Parker (1952). He remained in Roach's group and recorded with it in 1953. In 1956 he joined Dizzy Gillespie's group, with which he toured the Middle East and South America. He also played with Donald Byrd (in Paris, 1958) and Art Blakey's Jazz Messengers (1959). He gave up his musical career for a time to work as a tailor. Later he joined a band in New Jersey, produced recordings, and wrote arrangements. In 1966-67 he made two recordings with Sonny Criss and later studied music in India (1969). In the 1970's he played with Sonny Rollins (1973-74) and again with the Jazz Messengers (1975). He led his own group in New York and recorded as a leader in 1979. The piano player, Walter Davis, Jr., appears here on Blue Note for the first time, and is a particular choice of Jackie Mclean's. "He's a good piano player, but he writes very well, too. Three of his tunes are on the record. One of them, "Greasy," is a cross between rhythm and blues and modern jazz. He came over to the house and played it, and I laughed, and said, "Let's put that on the record, just like that! That tune's a lot like Walter. A very pleasant, very humorous guy." 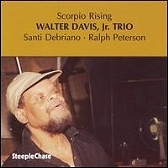 The three Walter Davis tunes--the boogie-based "Greasy," up-tempoed "Sweet Cakes" and the lovely rhumba "Davis Cup"--introduce a composer and pianist sure to become increasingly important. 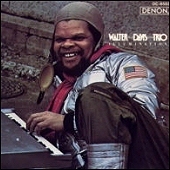 A selected discography of Walter Davis albums. Davis Cup, 1959, Blue Note. 400 Years Ago, Tomorrow, 1979, Owl. In Walked Thelonious, 1987, Mapleshade.